Chromogenic print, 60 x 30 in. 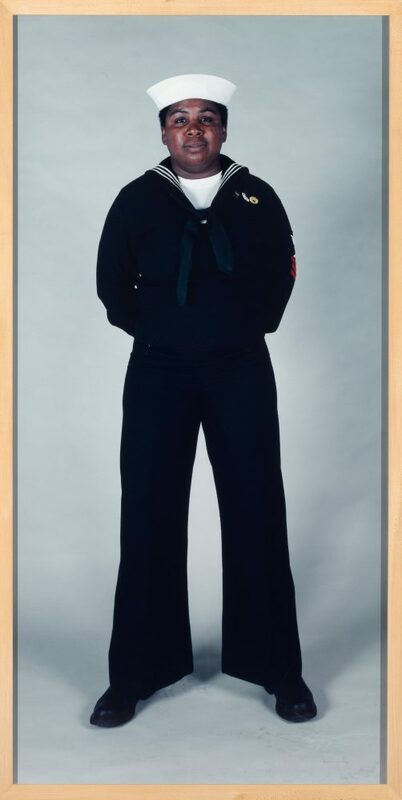 Catherine Opie is a critically renowned photographer, best known for her frank and endearing portraits of sitters from an array of sexual, racial, and socioeconomic backgrounds. Her body of work consistently interrogates reductive, stereotypical conceptions of identity and family. Renee is a member of Opie’s Portraits series, a group of 50 photographs created between 1993 and 1997. Sitters in Portraits include the artist’s extended network of gay and lesbian friends. The conceit of the series was partly inspired by August Sanders’ Menschen des 20er Jahrhunderts (Citizens of the 20th Century) (1927), a collection of documentary style portraits of citizens from the Weimar Republic. While Sanders’ series organizes sitters by profession or social class, Opie’s portraits endeavor to capture the enigmatic identity of each individual subject absent any typifying categorization. Photographing her subjects against bright, monochrome backdrops in various shades of blue, brown, green, purple, or red, Opie nods to the work of Northern Renaissance court painter Hans Holbein the Younger. These backdrops allow her to capture each sitter absent a specific setting or any environmental detail. We see them—their particular essence and physical presence—ostensibly how they have chosen to be portrayed. Like Renee, most sitters in the series gaze directly at the camera, and by extension the viewer. Expressions vary from person to person. Some are defiant and confident, while others are bemused, pensive, even bored. Opie captures a range of subjects and expressions, thereby challenging preconceptions of what individuals who identify as LGBTQ should look like.